Andee Nathanson at Frosty Freeze, Malibu. Photo by Cathy Chazan. Below we’ve given you just a tiny taste of the archive. There are hundreds of images. Please contact Andee directly for details and samples. 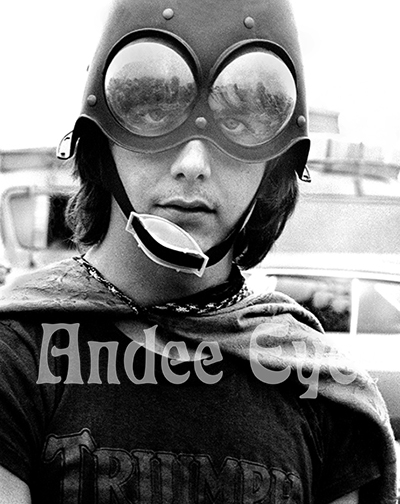 Coming soon, Andee Eye is a photography book featuring the work of Andee Nathanson from 1965-1978. Whether she was exploring the Joshua Tree Desert with Mick Jagger, Marianne Faithful and Gram Parsons or touring with Mad Dogs & Englishmen’s Joe Cocker and Leon Russell, Andee Nathanson’s photographs resonate with vibrant warmth and an unparalleled intimacy. Culled from a vast archive, years of a life well-lived, Andee Eye offers the first glimpse of Nathanson’s incredible collection of images. This is a young woman’s journey into the dream of ‘60s and early ‘70s – vivid, candid moments captured through unprecedented access and a deep connection to her subject matter. Throughout her youth, Nathanson continually photographed her close family of friends, a tightly knit group of artists whom just happened to include the likes of Mick Jagger, Ringo Starr, Donovan, Papa John Philips, Dennis Hopper, David Hockney, and many, many more. During this era, Nathanson would also document the rise of Tom Petty and Alice Cooper, shoot the cover of the legendary Frank Zappa album, Hot Rats, and journey through the back roads of a lost America. A model, muse and artist herself, Nathanson’s lens explores locations from Rome to London, Los Angeles to Morocco. The result is a psychedelic adventure amid the wide expanse of the California High Desert, the upper-class enclaves of British aristocracy, and along the palm-lined curves of Mulholland Drive. A poetic overview of an incredible moment in cultural history, Andee Eye features a rich and enticing world - icons of music, art, fashion and film - all seen through an insightful female gaze.